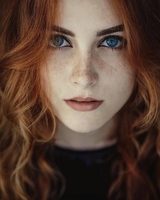 At only 5’0, Tailyn has to draw herself up to her full height in order to draw any sort of attention to herself, but with her characteristic Inarta fire red hair, splashes of freckles, bright blue eyes, and emphatic personality she somehow manages. Tailyn’s shoulder length hair is thick has a slight wave to it, and rarely if ever does she tie it up. She is fit lady, although her muscles are subtle and it’s not entirely obvious at first glance. Her hands are scarred with dozens of bite marks from various birds of all sizes and types. Tailyn’s energy emanates from her like an aura, her intensity almost a physical trait of her. A hunter, an explorer, and a lover of parrots, Tailyn left her home city of Wind Reach to chase her dream of finding, breeding, selling, training, and caring for tropical birds. Syka, a world far away from the cold wind blasted land that she was raised in, seemed the obvious choice. A new settlement, bustling with possibility and on the edge of an untouched tropical land was the perfect choice for pursuing her dream. Recklessly, Tailyn cast away everything she knew. With only a handful of belongings, money and her beloved pet macaw, Blue, Tailyn set sail. Her first plan is to find a mate for her partner. Then to gather at least one other breeding pair of unique parrots. Beyond that, who knows what awaits? Tailyn always goes a full one hundred percent. If she’s happy, then she a pure bubbling mess of delight. If she’s sad, then her misery could cloud the sky. If she’s angry, then her temper can split iron. This has a dual effect on those who have the pleasure or displeasure of dealing with her. In her happy moods she is a delight. When unhappy, she can be unpleasant and nearly impossible to be around. It’s possibly for this reason that Tailyn has never had any long term romantic relationships with anyone. When it’s good it’s good, but when those bad times come around than people are quick to bow out. Her intensity can draw people in, but that same intensity can drive away those unprepared to deal with her. Tailyn is well aware of her intensity, and during first encounters she will usually attempt to temper herself a little bit in order to not entirely drive people away. She’s an empathetic person, and during her good moods she can be very caring. When dedicated to something, in particular her parrots, nothing will get in the way of her taking care of what needs to be done no matter how poor her mood. She just tends to her tasks in whatever mood is striking her at the time. Tailyn despises cruelty, particularly towards animals, and there are few things that will kindle her temper like mistreating an animal. Born and raised in the chaotic cluster of Wind Reach, Tailyn’s bright spirit earned her the curiosity, delight, and sometimes ire of her fellow Inarta. Her mother was dek and her father unknown; she was raised among the bustling nursery until 8 years old, when she was taken into the Yasi. Once among her fellow youth, Tailyn soon demonstrated a natural talent with hunting, and with birds. Although she got along well enough with the falcons and hawks that are idolized in Wind Reach, she had a love for non predatory birds and frequently enjoyed the company of finches, songbirds, ravens and crows. Tailyn was fascinated in teaching the birds tricks and tasks. In particular, she loved pigeons, and their unique messenger functions. One pidgeon she named Night, and the two of them were nearly inseparable. Eventually, Tailyn was accepted into an apprenticeship for hunting. She and Night would spend long days out hunting among the mountains, and the two would keep each other company. Tailyn and her pet were well recognized among her peers, and she gained reputation for her sheer tenacity and go get em attitude. One day, tragedy struck in the form of a wild hawk who caught and killed Night. Devastated, Tailyn fell into depression. Months after the death of her bird, and after having refused many attempted gifts of various birds, her teacher surprised her with a very unusual creature. Tailyn had never seen a parrot before, so she was shocked into acceptance by sheer incredulity. The bird, a female Hyacinth Macaw, was bred and hatched far away from her jungle home and was too young even to fly. Tailyn named the bird Blue, and threw everything into raising the creature. She found the bird uninterested in meat, and soon found the only things she could tempt it with was various types of seeds, nuts and fruit. Tailyn quickly fell in love with the bird. No other bird she had ever known had nearly the personality of Blue. The pair flourished together. Tailyn soon became famous for the brightly colored blue parrot on her shoulder. She taught Blue many of the things she had taught Night, and brought her out on nearly every hunt. The bird’s massive size discouraged predators, and Blue soon proved herself to be formidable in her own right, delivering fearsome bites with a strong beak on any who crossed her. Blue soon also proved to be an astounding mimic, better even than the ravens, and would chatter on for hours although she soon learned to keep quiet during hunts lest she be left behind. Tailyn’s love for Blue became an obsession. She dreamed about tropics filled with brightly colored birds, and fantasized about having mews filled with the creatures. Gradually, Tailyn’s responsibilities towards hunting began to slip. She came up with excuses, and instead spent time teaching Blue new tricks. This was not viewed by her colleagues well, and she was not-so-gently reminded that those who couldn’t keep up with their responsibilities would not be able to keep their caste. The threat of becoming a dek shocked sense into Tailyn and made her begin to think. Although she had no hatred of her homeland, she had no real love of it either. And the world was beginning to tighten around her and feel claustrophobic. Quietly, Tailyn fell back into line, back into good graces, and for months began to gather money and resources. Finally, with little flourish, Tailyn said her goodbyes and departed, to her associates shock and horror. Tailyn decided on going to Blue’s homeland, and it didn’t take her long to learn of the new and thriving settlement of Syka. Defiantly, the young woman set course, determined to pave her own future. Over the course of several years, Tailyn spent time studying the basics of travel in the jungle and learning the things she’d need to thrive there. She lived for a time in Riverfall, studying what information she could gather about the area, and learning to speak the bare basics of Tukant while she was there. Eventually, feeling she was ready, Tailyn purchased everything she’d need to start up a business, and set sail for Syka. Last edited by Tailyn on August 22nd, 2018, 3:26 am, edited 3 times in total. Last edited by Tailyn on September 1st, 2018, 5:44 pm, edited 4 times in total.